This is an incredibly easy dish to cook. Apart from a bit of chopping at the start and a lot of eating at the end, there’s not much to do! It’s a very soothing meal and a favourite of mine if I’m feeling a bit under the weather or at the merest hint of a cold to boost the immune system. 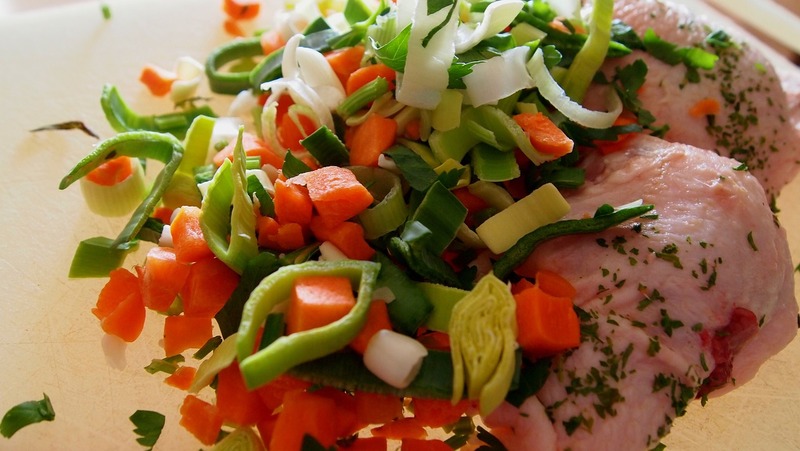 Place the chicken in a large casserole dish and cover with water. Add the chopped onion, bay leaf, celery, garlic cloves and chopped sweet potatoes. Season well with salt and pepper. Bring to the boil, then pop the lid on and leave to simmer for about 20 mins. Now add the carrots and continue to simmer for another 30-40 minutes until the chicken is cooked. The chicken will be ready when you can pull the legs & they come away easily. Remove the chicken from the broth and rest it somewhere it will keep warm. Add the peas and spinach to the broth and cook for a couple of minutes, until the spinach has wilted. Spoon off any fat that has risen to the surface. Check the seasoning and add any further salt or pepper to taste. Pull the chicken off the bone & place in a bowl. Spoon over the broth with the vegetables and sprinkle with the parsley.